The famous constellation Orion will soon disappear for another season. At this time of year, Orion is descending in the southwest to west in the hours after sunset. This constellation is noticeable for its bright stars and its distinctive pattern on the sky’s dome. Look for three stars in a short, straight row. 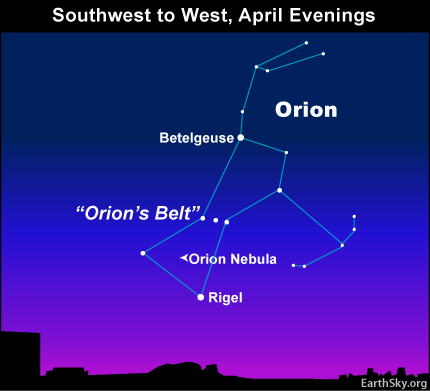 Also look for Betelgeuse and Rigel, Orion’s brightest stars. If you did not come to know it this winter, check it out now. It is one of the most distinctive of all star patterns. Today’s chart is marked with the location of a cloud in interstellar space . . . located in the direction to Orion. Binoculars or small telescopes reveal the beautiful Orion Nebula, otherwise known as M42, if you have a dark-enough sky. Will you spot the nebula in a twilight or early evening sky on these April evenings? The only way to know for sure is to look. If you do find the Orion Nebula in early evening now, you will spot it in the middle of a curved line of stars that appears attached to Orion’s Belt. This curved line is the Sword of Orion. The Orion Nebula looks to the eye like a hazy “star” in the Sword. However, the slightest optical aid reveals much more. Site contents copyright © 2019 Recorder Online	except as noted. All rights reserved. | 88 queries in 2.098 seconds.